Track all billable items in real-time, generate bills with a few clicks and deliver them via email. 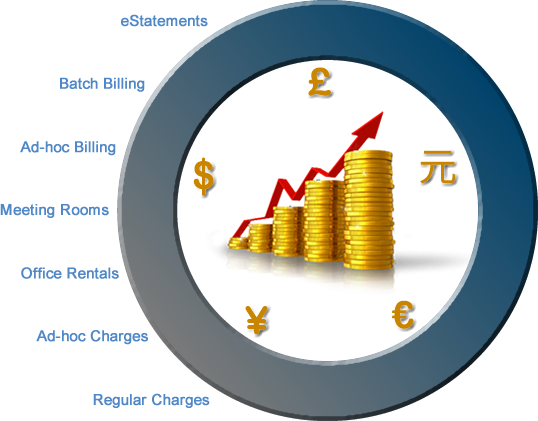 With UltraSoft Billing module automate entire billing process from ad-hoc billing to month-end batch billing for your business centre and deliver bills and statements electronically. Generate ad-hoc bills on demand. Bill office rental from contracts. Bill regular fees for contract services. Bill variable charges entered in POS. Deliver invoices as PDFs by email. Deliver statements electronically as PDF. Generate bacs or direct debit feed. Generate feed for accounting system. Generate key financial analysis - KPI.